Fresh from their impressive 4-0 away victory at Ascoli, Torino will attempt to make it back to back victories as they face Grosseto at home on Friday evening. A victory for Torino would mean, that for a few hours at least, they would occupy the final Playoff position in the Serie B table. If that were to happen, then it would send a message to the rest of the playoff contenders that the talk of Torino's demise throughout the last few weeks, was certainly premature. However, tomorrow's match will certainly be a difficult one against a fellow playoff rival, because a victory for Grosseto would mean that it would be them who would overtake Torino and take sixth place, evidence of just how close the division is at the moment. Franco Lerda's return as Torino manager was a successful one as they enjoyed an emphatic 4-0 victory away at Ascoli, and gave their fans renewed hope of achieving a playoff birth. After a miserable one month period, in which Torino had lost four consecutive games, sacked two managers, and then rehired Franco Lerda, the man they had previously sacked, Torino's stylish return to winning ways was unexpected but long overdue. Torino got off to an ideal start, with Rolando Bianchi ending his mini goal drought when he headed home after just seven minutes. On the stroke of half time, Torino doubled their lead, when Luciano Zavagno's fine cross found Bianchi whose bullet header gave the home goalkeeper no chance. Just sixty seconds into the second half, Torino got their third goal in fortunate circumstances after Alessandro Budel's free kick was diverted into his own net by Vasco Faísca. However, the game was not over just yet, and Ascoli had an opportunity to gain a foothold in the match just one minute later when Claudio Rivalta's handball gave them a penalty. However, Luigi Giorgi saw his spot kick saved by Rubinho in the Torino goal, and when Mirco Antenucci added a fourth goal with a outstanding curling effort, the result was beyond doubt. Whilst it would be wrong to ignore all the problems that led to Torino losing four consecutive games in the first place, this result will certainly give renewed hope that all may not be lost in this season. As things stand, Torino are just one point away from the final playoff position, and if the team can display the same degree of team spirit and quality that was shown in this match in their remaining fixtures, then there is no reason why they can't reach the playoffs. After Franco Lerda's shock return to the club, Torino will be eager to avoid a fifth consecutive defeat and attempt to reignite their slim promotion hopes with a victory. Despite their disastrous recent form, incredibly Toro only find themselves four points away from the last playoff position. However, Ascoli should not be taken lightly, as they have won their last two matches, and if it wasn't for the fact they were deducted five points due to financial irregularities, then they would be level on points with Torino. Whilst Torino will obviously be concerned by the fact they have lost four games in a row, another worry is the fact they have not scored a goal in their last three games. The fact that talisman Rolando Bianchi has not scored since he got winner against Portogruaro way back on the 26th February will also be a worry, and one which will hopefully be rectified on Saturday evening. For the first time this season, the result was not important, but for the record Torino Legends and Juventus Legends shared the spoils in an entertaining 2-2 draw. The real winner of the night was the Amyotrophic Lateral Sclerosis charity for which the match was held for, and the €223,000 which was raised emphasises the fact that it was a huge success. In front of a unusually large crowd, the first half consisting of thirty-five minutes saw Torino Over 45s take on their Juventus counterparts, with Torino scoring the only goal of the half, fifty-six year old Leo Júnior scoring one of the easiest goals of his career, from just five yards. The second half saw the Over 35s take over, with World Cup winner Zinedine Zidane taking the field for Juventus, and Gianluigi Lentini, the man who was once the world's most expensive football player, playing for Torino. Toro extended their lead early into the second half courtesy of Lentini, who rolled back the years as he dribbled into the area unchallenged to score. Juventus got a goal back minutes later, when Zidane's cross found Pavel Nedved who scored with a neat back heel. As often happens in charity games, the game finished level, and Juventus scored their equaliser with about ten minutes remaining via Sergio Porrini's diving header. Whilst Torino and Juventus enjoy a fierce rivalry as the two football clubs of Turin, both teams are putting aside their differences and uniting on Wednesday evening for a worthy cause. The charity match, that will take place at the Stadio Olimpico in Turin was the idea of Michele Riva, a Torino fan who is suffering from Amyotrophic Lateral Sclerosis, (also known as Lou Gehrig's disease) and this event will hopefully raise both awareness and funds for ALS charities. The complete squad lists of which players will be involved can be found below, and as both Torino and Juventus are enduring disappointing seasons, fans of both clubs will probably wish they could rely on these players for the rest of the league campaign. Incredibly, just eleven days since their last management change, Torino have once again sacked their manager, and replaced him with the man they had previously dismissed. Giuseppe Papadopulo's tenure as coach of the seven time champions of Italy proved to be a short one, as defeats in both his two games in charge has led to his prompt dismissal. Torino president Urbano Cairo has reappointed Franco Lerda as coach, the same man who was sacked in order to appoint Papadopulo, as they attempt to find a solution to their terrible run of form, which has seen them lose four games in a row. This incredible saga is sure to make Cairo even more unpopular with the majority of Torino fans, who see him as one of the main reasons why they are in Serie B. Therefore, the news that Cairo will vacate his position as president at the end of the season is sure to be welcomed. Despite their dreadful recent results, Toro still only find themselves four points away from 6th place, and although it would be unlikely, if Torino could recapture some of the form they enjoyed before Christmas under Lerda, they could make the playoffs. Whatever happens from now until the end of the season, it promises not to be dull, with Torino, it never is. As the lyrics to a well known song say, 'things can only get better' and Torino will be certainly hoping that is the case when they face their next Serie B fixture away to Frosinone on Saturday. After three successive defeats, new coach Giuseppe Papadopulo will be hoping to get a first victory under his belt for his new club and try to reignite their slim chances of promotion.Whilst they are only two points off the final playoff position, it is perhaps their inconsistent form that will be more of a hindrance to their promotion ambitions, as they have already tasted defeat on twelve occasions this season. Frosinone have also had a disappointing campaign, and find themselves in serious danger of being relegated as they currently occupy 21st position. Therefore Torino will have to be aware that they will be equally if not more desperate to gain the victory on Saturday. If Torino fans were hoping that the appointment of Giuseppe Papadopulo in mid week would lead to a change in fortunes, then for the time being at least, they were mistaken. Torino's home defeat against fellow playoff chasers Livorno was their third consecutive defeat, and their 12th defeat in all this season, meaning they have now lost more games than they have won in the league. Torino had started brightly in the first game under their new coach, and Rolando Bianchi could have given them the lead after just two minutes, but his header was comfortably saved by Alfonso De Lucia in the Livorno goal. Bianchi's strike partner Mirco Antenucci also came close to giving the home side the lead, as he latched on to a long ball, but saw his shot go just wide of the far post. Livorno also had their chances in a feisty but entertaining first half, but Francesco Tavano somehow failed to hit the target when it seemed easier to score, sadly for Toro however, he would compensate for that miss in the second half. Livorno took the lead ten minutes into the second half, as former Torino player Ahmed Barusso's long pass found an on running Franceso Tavano who finished calmly. The Torino defence seemed to be distracted by the presence of a Livorno attacker who was in offside position, but their was no debate about whether Tavano was offside when the pass was played, because he clearly was. However there were more complaints regarding the second Livorno goal that came from the penalty spot after Agostino Garofalo was adjudged to have fouled Federico Dionisi in the area. Whilst it looked as though Garofalo had made contact with the ball, Torino were also upset with the fact that in the build up to the move, the linesman had raised his flag, but then looked to have changed his mind and play continued, despite several Torino players seeming to stop when they saw the flag go up. This defeat has moved Torino down to 11th position in the table, though incredibly just two points from 6th place, which emphasises just how tight the Serie B table is at the moment. Whilst Torino's next two games are both away from home, the fact they are against Frosinone and Ascoli, two teams in the relegation zone may give their fans added hope they may get back to winning ways sooner rather than later. 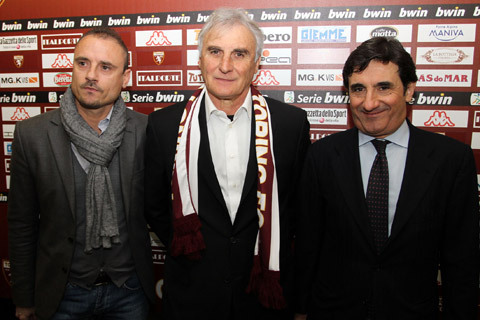 Torino will begin their reign under the stewardship of new coach Giuseppe Papadopulo with a home game against Livorno, who are coincidentally managed by former Toro coach Walter Novellino. After two successive defeats, which ultimately cost Franco Lerda his job, Torino will be eager to get back to winning ways and keep their playoff dreams alive. Livorno currently lie just one point and one place behind Toro, so will still believe in their own chances of reaching the top six. However, Torino will be weary that even if they gain a position in the top six at the end of the season, the playoffs may not be held, because if their is a gap of ten or more points between the teams that finish 3rd and 4th, the 3rd place team would be promoted automatically. Whilst the gap between Novara (currently in 3rd) and Varese (currently 4th) stands at seven points, Toro must hope this gap does not widen, or else, as happened in the 2006-2007, the playoffs would not be held. Angelo Ogbonna has recovered from flu and is expected to start, whilst Agostino Garafolo is included in the squad and could regain his position at left back. Torino's promotion hopes were dealt yet another severe blow as they succumbed to another defeat, this time away to Vicenza. This latest defeat was Toro's fourth defeat in their last six games, and it seems the victories against Pescara and Portogruaro may only have been a temporary reprieve from what has been a disappointing second half of the season. Torino had the first meaningful effort in the game, as captain Rolando Bianchi received the ball outside the area, and unleashed a long range shot that went narrowly over the bar. However, the turning point in the game occurred just before the half hour mark, when Stefano Botta was fouled by Toro goalkeeper David Bassi, to give the home side a penalty. The award of the penalty could perhaps be described as harsh, and the penalty was converted by former Torino striker Elvis Abbruscato to give Vicenza the lead. Torino had opportunities to equalise in the second half, the best of which fell to Bianchi, who was extremely unlucky to see his fierce volley hit the crossbar. Torino will be eager to get back to winning ways as they face the difficult away journey to Vicenza on Monday evening. The weekends results were kind to Torino, so they know that a victory would put them back into the playoff positions, however a victory for the home side would mean they would join Torino on 41 points. Toro will be without goalkeeper Rubinho who injured his hamstring in the defeat against Atalanta, and could be out for two weeks, Davide Bassi is expected to replace him. Their are also doubts over Angelo Ogbonna and Alessandro Budel who are both suffering from flu, but will hopefully recover in time for kick off. Torino will be looking for their third consecutive victory as they face top of the table Atalanta at the Stadio Olimpico tonight. The game will be an opportunity to assess how far Torino have progressed in the last couple of weeks, and a victory against the men from Bergamo will certainly send a message to the rest of the division that they are credible promotion candidates. Denilson Gabionetta has been included in the squad for the first time, and could make his debut for the club, whilst Rolando Bianchi is expected to recover from the injury that forced him off against Portogruaro.